The self-running slideshow at the top of the page will take you through all 13 photos illuminating the most successful principles of evolution. These principles will provide you with the most powerful and lasting keys to personal, family and business success. We call this group of evolutionary principles the Universe Principles of Right Action. If you keep clicking on the Previous, Resume or Next links at the bottom of the slideshow image, it will allow you to navigate through the images. This page will also give you a quick idea of some of our core values at Universe Spirit. In the complete collection of Universe Principles, you will see the full cycle of energy in the universe as it manifests in successful, sustainable and thriving systems. Every aspect of the full cycle of energy from creation to transformation and transmutation is covered, including how to increase energy efficiency, energy sharing or energy reserves. To help you better visualize the energy management relationships of each Universe Principle you will also find a short [bracketed statement] describing how this principle works within the full cycle of energy creation and transformation after each principle. Be particularly watchful for positive "accidents” and serendipity when they do occur. Aggressively pursue and utilize these positive accidents and serendipities as well as real opportunities!. This principle improves energy creation for later sharing by finding new sources for energy exchange. Gather current knowledge and life-adjustment essential feedback through present awareness and consciousness of self, others and the physical Universe. Also, gather and be aware of past historic knowledge on self, others and particularly the Universe to learn life’s guiding principles and to develop exchangeable life skills and knowledge. (Studying the history of things is past awareness (past consciousness,) and it is an essential and highly useful complement to present awareness in most, but not all situations of life. Various meditation practices are tangible ways to increase your ability to be aware and conscious of present moment feedback. Developing listening skills is another great way to increase your awareness of the feedback from others. This principle refines the energy creation and maintenance for later sharing. Rapidly learn from all accurate correctional feedback that you receive from your life experiments then use that new information to adapt. If you cannot adapt to it, change the environment wherever possible and appropriate. In order to optimally advance individual and group learning and adaptability to one's improve experimentation success it is also essential to teach future prediction and future modeling skills using everything from one's own intelligence to super-computers. Doing experimentation with future modeling computer simulations allows one to experiment and tinker at a fraction of the normal cost and without the dangerous or costly mistakes of real experiments. Experiment, learn and adapt is a core cycle of evolution. This principle further refines energy creation efficiency for later sharing. Abundant and sustainable productivity is one of the Universe meta-principles because of the reality of the Second Law of Thermodynamics known as entropy. Because all natural systems require additional energy (human effort is energy too,) to sustain or reproduce themselves and/or create new order (in the forms of products or services, life or creating a dynamic equilibrium,) to counter the effects of entropy --- abundant and sustainable productivity using continuous and in many cases increasing energy and effort is a fundamental inescapable reality of life. Please note that both exchange and productivity can be of both an economic or non-economic nature. There are many noneconomic products and services that contribute to the wellbeing and sustainability of the grouping, community or nation. Fair exchange also is one of the most essential ingredients in group cooperation building. Group cooperation building depends heavily on trust which comes and is expanded by reciprocal fair exchange! This core Universe Principle is all about energy exchange reciprocation (fairness,) and increasing energy creation sources within a whole or group to counter and overcome the continual effect of energy entropy. This principle means that everyone who is not a child, sick, elderly, disabled mentally or physically or injured should be productive and produce more energy than they use because of entropy and the need for individual and group reserves (discussed in another Universe Principle farther down this list. Improve self-organization, self-discipline and self-responsibility to increase freedom and wise choice in self and in one's groups in a way that self-interests, group interests and Universe value-interests are aligned and balanced! An additional aspect of this principle and of the principle of building more cooperative groups and communities (a bit farther down this page,) is to always create and promote as much personal freedom for the group's or communities' individual members as is possible up to the point where the exercise of the individual freedom of that group or community member seriously debilitates or destroys the overall wellbeing and sustainability of the union threatening the existence and essential functions of the group itself. This principle demonstrates the practical energy creation or maintenance truth that individuals parts within a system and whole are ultimately better at energy creation and energy management when given the highest possible amounts of local freedom and autonomy. Insure timely fair and appropriate consequence capture for ALL individuals or groups that caused a particular consequence. Do it through appropriate transparency, truth sharing, co-responsible accountability and where applicable triple bottom line, full-cycle accounting. c.) success-enhancing positive reinforcement feedback in the fastest and most efficient way. Ensuring fair and appropriate consequence capture along with its essential justice partner of fair exchange are two of the most basic, powerful and evolution-proven ways to create the minimal justice necessary to maintain the essential cooperation building trust and wellbeing in any individual or group as well as the fastest possible positive evolution! Fair and appropriate consequence capture is also another effective way to prevent freeloading, “gaming the system" and non-fair-exchange, nonreciprocal energy and resource theft, which inevitably first weakens then destroys group trust and reciprocality, which then destroys the sustainability and thrivability groups and unions.) A critical element of both fair exchange and the fair and appropriate consequence capture reciprocality principles is that of scaling the positive (reward) and negative (punishment) consequences. In a healthy sustainable system, an individual or group should always receive the fair, appropriate and proportionally increasing rewards of their productivity that demonstrates higher levels of intelligent effort, merit, and quality of results. The same is true of scaling appropriate and proportional penalties. High and expanding levels of transparency and accountability are critical to enacting fair and appropriate consequence capture because the powerful evolutionary self-interests of either the individual parts or the self-interests of wholes [groupings/unions,] when hidden or not accounted for will always take over and lessen the essential optimal balance and tension between the self-interests of the individual and the self-interests of the whole group or union. Remove this single critical and central meta-principle and the parts and groups within the system do not learn from their own negative and positive feedback quickly or efficiently or--- at all! Believe it or not, when seen from the universe perspective having ALL individuals or groups always fairly and appropriately capture both the positive or negative consequences of their own actions is not only the fastest way to adapt and evolve it is also the most merciful and compassionate way because in general an "earned" consequence delayed in a consequence intensified! In the new Universe Manifesto ebook soon to be released more will be said about what determines fair appropriate levels of positive and negative consequence capture in sustainable natural and social systems. This fair and appropriate consequence capture meta-principle is also about energy exchange reciprocation (fairness,) multiplying vital energy creation sources within a whole or group through energy rewards and lessening energy depletion sources within a group though energy penalties. This critical principle helps to maintain energy productivity and fairness within every whole system or group. In spite of what we have heard about survival of the fittest evolution actually favors the survival of the most wisely cooperative. Wise cooperation occurs in conditions of general fairness, trust, and reciprocality. Therefore ensure group fairness, trust, and reciprocality and then wisely COOPERATE. Wise cooperation also implies using all of the Universe Principles as a whole system of principled guidance to know when and how to cooperate or how to know when not to cooperate until the necessary trust, fair exchange, reciprocality and other conditions for wise cooperation have been established. The principle of wise cooperation is partially about preserving energy reciprocation and energy conservation (so you do not violate the second law of thermodynamics,) while working more importantly towards managing balancing and aligning the tensional self-interests of the parts of the whole to the overall health and well being of the whole union as well as to the value interests of the Universe. This then creates greater and wiser energy sharing in scale, frequency or quality. A way to think about unwise cooperation is that it is when --- you or your group does worse, gets fewer resources to reproduce or sustain itself while another individual or group does better or gets more resources to reproduce or sustain itself. Wise cooperation is always solidly grounded in fair exchange and aligned and managed self-interests. Build and/or replicate both more and larger unions and mini-cultures where self-interests, group/union interests, and Universe value-interests are mutually aligned in a win/win/win scenario. When enough groups create enough unions and mini-cultures that follow these universe principles of sustainability these principles will eventually move into a larger union and permeate and be taken on by the macro-culture. Imitate a whole systems understanding of universe evolution at every opportunity, which appears to be moving toward creating a super-union of all universe parts, wholes and sub-unions by creating more wise unions. The principle of creating more or larger unions (through wise cooperation,) is about working towards creating greater energy sharing in scale, frequency or quality. Better energy sharing creates stronger more sustainable groups and unions. Improve the transparency, integration, harmony and dynamic flexible order in one’s groups and communities that is also universe value-interest aligned and balanced. This principle improves the efficiency of energy creation and sharing for and among the parts of a group/union. Better energy sharing creates stronger more sustainable groups and unions. Aligned with universe's value interests (above), work actively both as individuals and as groups or communities toward realizing ALL individual unrealized potentials and the unrealized potentials of your groups or communities to learn, adapt and develop and, where possible, to transcend the current conditions and challenges! 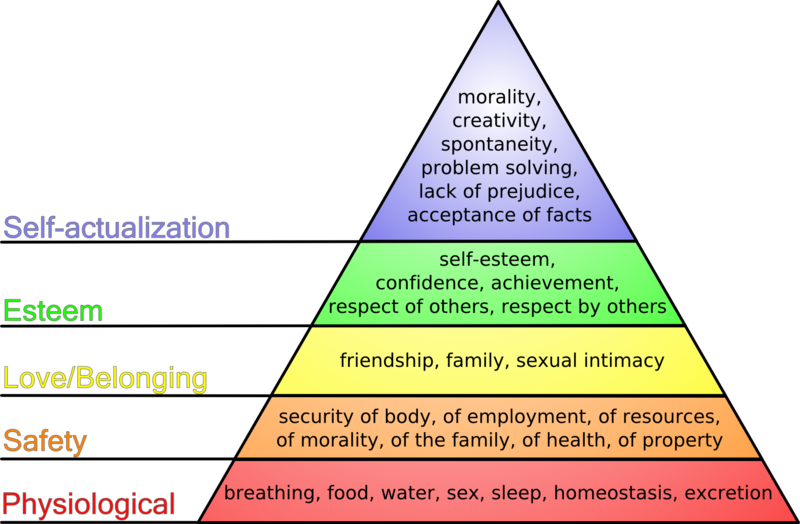 Development of individual and group unrealized potential here means the full spectrum of possible development as expressed in achieving fulfillment potentials such as expressed basically in Maslow’s Needs Hierarchy or more complexly in Kegan's model of psychological development or Kohlberg's stages of moral development. This principle helps to realize the full energy creation efficiency of the individual parts or members of a group or union. Build robustness, redundancies and adequate reserves into both individual parts and all groups and unions to build adequate resilience and the necessary reserve abundance to insure against rare, very large-impact negative consequences and unpredictable emergencies caused by inherent system uncertainties and “negative black swans.” This reserve abundance building also provides the resources for wise and appropriate energy investment or charity and group support for illness or physical or mental incapacitation or other situations where a member of the group is unable to produce more energy than they use, such as in the case of growing children, the retired or diminished capacity elderly or those injured in work or defending the nation. This principle is about energy storage and energy abundance availability --- namely to ALWAYS have enough energy reserves available to maintain individual or group resilience and energy use requirements when either an unexpected energy loss occurs (a crisis, emergency, etc.,) or when temporarily or permanently nonproductive members of the group require additional energy support. In addition to the Second Law of Thermodynamics known as entropy, it also is necessary to have these reserves because of the additional lessening effects the law of diminishing returns, which will eventually always bring about a collapse in systems without new energy sources or emergency back up reserves. Improve one's self and one's group's evolvability by teaching, knowing and using the Universe's value-interest aligned principles. Use these evolution principles of sustainability to intentionally create the education, governance and management systems to teach others, to replicate and create new and larger more successful universe principle based mini-cultures and groups/unions and to replicate and expand the mini-cultures of this Universe Evolutionary Worldview and sustainable prosperity movement into becoming the macro-culture. Also, use them in all areas of life to directly expand your and your group's sustainable environmental control. Improving individual and group evolvability and environmental control particularly includes creating future awareness and adaptable intelligence by using rational/analytical thinking, systems thinking and new dialectical thinking future modeling and risk analysis technologies for wise evolution aligned future planning and model testing. This is another principle that is about improving the efficiency of individual and group energy creation and energy management by understanding the universe's best practices for energy creation and management within parts and wholes (individuals and groupings. Keep vividly in mind that failure to align oneself, one's groups, businesses and nations with the core universe patterns, value interests, principles and directionality of progressive evolution (as found above and within the Universe Principles of Sustainability when applied in an integrated whole systems manner,) results in the other great meta-pattern and meta-process of progressive evolution to take over. This hub process, hub pattern and universe meta-principle of sustainability is: the universe in an act of destructive creation breaking down and recycling any and all continually non-learning, non-adaptive and/or non "cooperating" parts or wholes to be recycled and reused later in other evolutionary experiments or situations. Evolution wastes nothing and unfailingly does this breakdown and recycling of nonaligned and non-adaptive parts or wholes in an act of creative destruction to once again attempt to forward the progressive directionality and value interests of evolution by reusing and recycling the resources of failed, no longer needed or relevant evolutionary experiments. From its original creativity to its ending destructive creativity qualities in the breakdown and recycling of non-learning, non-adaptive and/or non-cooperating parts and wholes the Universe Principles of Sustainability create a full creative cycle and creative spiral containing everything essential to keep the directional; processes of evolution progressing. This principle is all about avoiding unnecessary energy loss and the understanding that any energy losses ultimately will be reused and recycled. We have finally reached the amazing phase of evolution where we can now become evolution’s partner consciously co-evolving universe evolution. The above are the actions that help us do it! When we simply live sustainable lifestyles and livelihoods applying the Universe Principles and we enact laws that reflect the application of the Universe Principles when applied to groups, corporations, and nations we will attain a just civilization and a meaningful and sustainable prosperity for all. And finally, in addition to these Universe Principles of Right Action there are corresponding and companion Universe Principles of Right Attitude. To view a slideshow of these Universe Principles of Right Attitude click here now. An additional and important way to think about and see the preceding "Right Actions" of the Universe Principles is to see them as the boundaries and formulas of individual and collective justice in an evolutionary system, particularly as it relates to energy sharing justice. If you see these principles collectively as the minimal operational rules and evolutionary "operating system" for creating, maintaining and sharing energy fairly and reciprocally that then can be used to establish stable unions good for both individuals and groups (dynamic evolutionary equilibriums,) you would also have a practical perspective on how to use them to establish either the foundational or essential ongoing energy sharing justice systems always needed so any human system can become more balanced and sustainable and thrive for more of its members. Regularly think about how you are or how are not currently using applying them in your life or in the groups to which you belong. If you are applying them, figure out how you can apply them more. If you are not applying them, figure out how you can then watch the proactive evolution unfold! It will take real life self-discipline to start and then continue to read and apply these life success and sustainability critical principles. If you found this page from some other page on our website or in an online search and have not seen the introduction to these Right Actions on this page, please click here for this essential introduction for the Right Actions discussed below. The rest of this online booklet contains beginner to intermediate level materials for this website. Learn much more, keep about the Universe Principles of Right Action by clicking the links at the bottom right of the page (or left,) for the all the pages of this online booklet. To view a slideshow of the Universe Principles of Right Attitude click here now. The fullness of joy is behold God in everything!